In 1964 #1000 Straight-leg Allan was released, and in 1965 #1010 Bend-leg Allan arrived. Both had molded red hair and brown eyes. They are marked: ©1960/by/Mattel, Inc./ Hawthorne/Calif. U.S.A. Allan was Midge (Hadley's) Boyfriend. 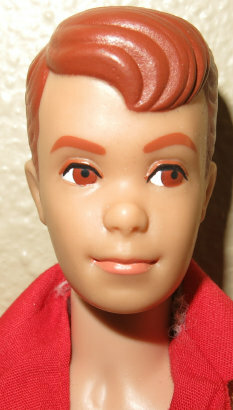 Mattel gave Allan a last name; Sherwood. He and Ken were the only males to have a last name. Allan was named after Barbara Handler's husband, Allan Segal. When Barbara and Allan divorced in the 60's, Alan was no more and discontinued after his 2nd release in 1965. 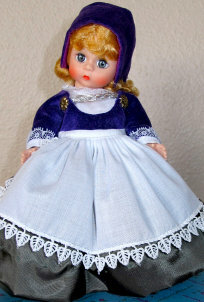 There were a limited number of dolls available until 1966. 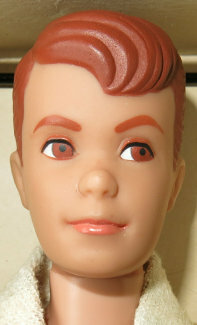 It wasn't until 1990 Mattel finally released a new version of Allan. In the box Straight-Leg versions had: blue shorts, horizontal striped jacket (some came in vertical), blue strap cork sandals, black wire stand, and booklet. The Bend-leg versions had: red jacket, lighter blue shorts, blue strap cork sandals, black or gold wire stand, and booklet. 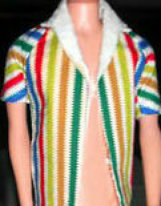 Other than the clothes he came in, Allan did not have any clothes of his own. He shared Ken's wardrobe. 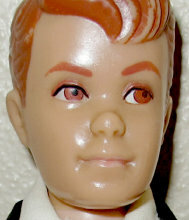 Some 1965 bendable leg Allan dolls have the same greasy face problem as the #5 ponytail and early bubblecuts.